Until I had a mouthful of mince pie this beer didn’t seem to make much sense. 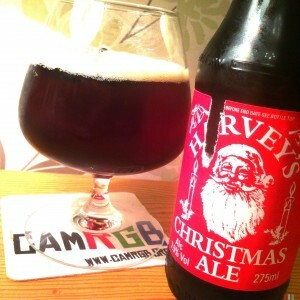 But after the pastry and dried fruit stodge Harvey’s Christmas Ale came to life. The smell is cloves and rum and reindeer hooves clattering across a pin sharp clear winter’s night. It’s difficult to talk about individual flavours, about constituent parts, as this beer is greater than the sum of its ingredients. Rich and strong and as red as Santa’s coat*, all the flavours here are warm and autumnal. From the sticky bonfire toffee apple to the maple leaf crunch of long walks wrapped in scarves, this is a beer that doesn’t taste of winter so much as reek of it. The finish is dry and crisp but drenched in brandy and no one can complain about that. * That’s L. Frank Baum’s Santa for all you Socialist Xmas Geeks. 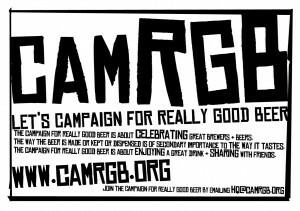 This entry was posted in Beer Review, CAMRGB and tagged 7.5% +, Beer, Beer Review, Bottle Conditioned, bottled beer, CAMRGB, Christmas, Drinking, Tax. Bookmark the permalink.